I am back with another empties post. This time I managed to empty products which I eventually forgot to use. I was very busy in the past days with my daily routine and hence didn't get time to eventually sort out my drawers. 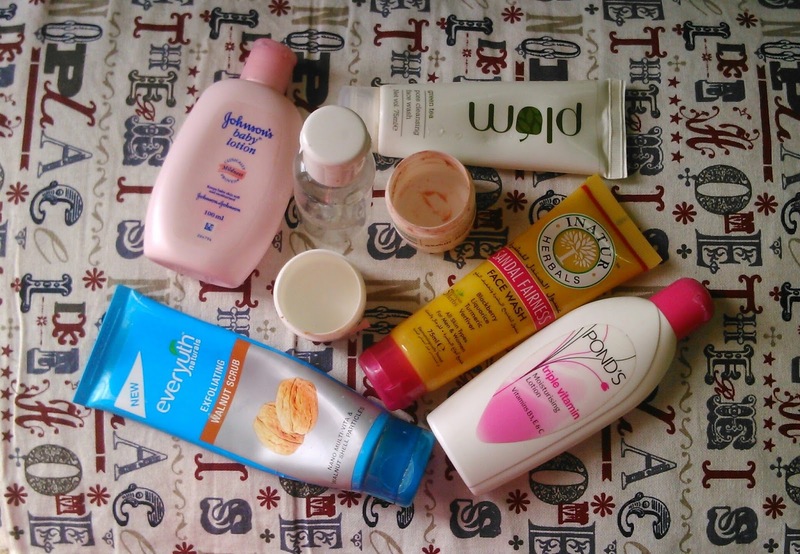 So today we will be taking a look at the skincare empties which I managed to empty after a strict skincare regime. Everyuth walnut scrub is my all time favourite scrub and I had been using it since years. The product has come a long way with a new packaging, smaller scrub particles and now the hydrogel technology, over the years. It is loaded with parabens but it doesn't dry out the skin, scrubs well and is an excellent body scrub. I recently tried Himalaya neem scrub and it broke me out. So this made me a loyal customer of Everyuth walnut scrub. Verdict - You may want to try it out but it has parabens. Aah, this mask brightens the skin from first use itself. It contains AHA though. I usually use it at night time because AHA exposes our inner skin layers to the sun and causing damage to the skin. The mask removes excess sebum, dirt, dead skin cells effectively. I has reduced my neck region pigmentation. Verdict - Use it at night time only and worth trying at least once. The aroma of this facewash is very green tea sort which is a little bothering at first but as you get used to the aroma it no longer bothers. The facewash is a normal facewash which controls oil and keeps acne in check. It used more than twice a day, it may dry out the skin then. I feel the price is a little overhyped for this product. Verdict - If you don't minding spending bucks on a facewash do give it a try. The green tea facewash from Aroma Essentials doesn't contain sulphate and has antioxidant rich green tea. It cleanses well and is great for everyday use. I find the packaging a little bit tacky though. But overall it is a great product which doesn't dry out the skin and is very suitable for even sensitive skin. Verdict - Suits sensitive skin too so a product for one and all. It a good exfoliating scrub which removes blackheads, but people with sensitive skin shouldn't use it because it has walnut particles which maybe harsh for the skin. Verdict - Worth trying once. Verdict - perfect face cleanser with the goodness of sandalwood. With the weather getting chill day by day in Bangalore I emptied these to keep Organic Harvest Lotion and Choco Body Balm for later use. So this was my empties list. What all is on your empties hit list?! Leave your blog urls for me to checkout.